The proposal put forward by the Chief Whip of the Opposition JVP Parliamentarian Anura Dissanayaka yesterday (8th) that a division was necessary at the vote to be held after the debate in connection with the agreement to hand over Hambanthota Harbour to China was accepted. When the vote was taken 72 had voted for handing over the harbour while only 7 had voted against it. 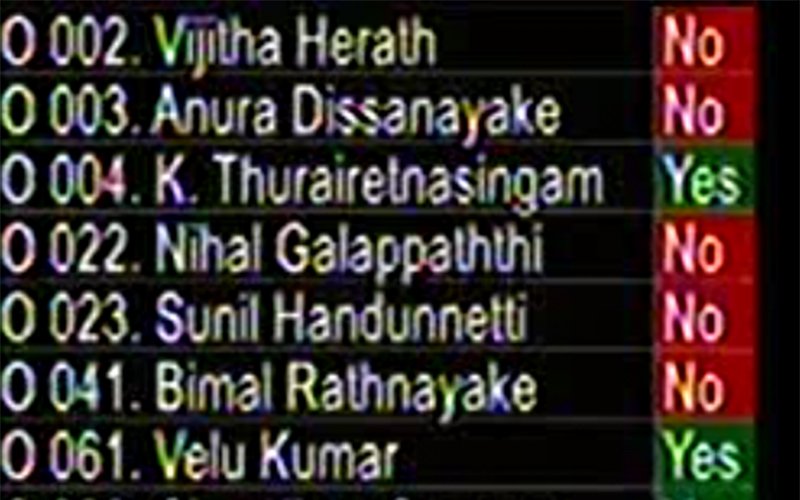 The JVP MPs voted against handing over the harbour to China while MPs of Mahinda faction refrained from voting. Accordingly, the proposal to hand over the harbour to China was passed with a majority of 65 votes. Seniors such as Dinesh Gunawardene, Vasudeva Nanayakkara, Bandula Gunawardene and inexperienced MPs such as Namal Rajapaksa were present in Parliament but none of them voted against the Ranil – Maithri decision to hand over Hambanthota Harbour to China. As the Local government Election has been announced, according to the circular LAE/2018/4B issued with the signature of the Chairman of Elections Commission Mahinda Deshapriya, the candidates have been barred from engaging in any development activities from 28.11.2017. 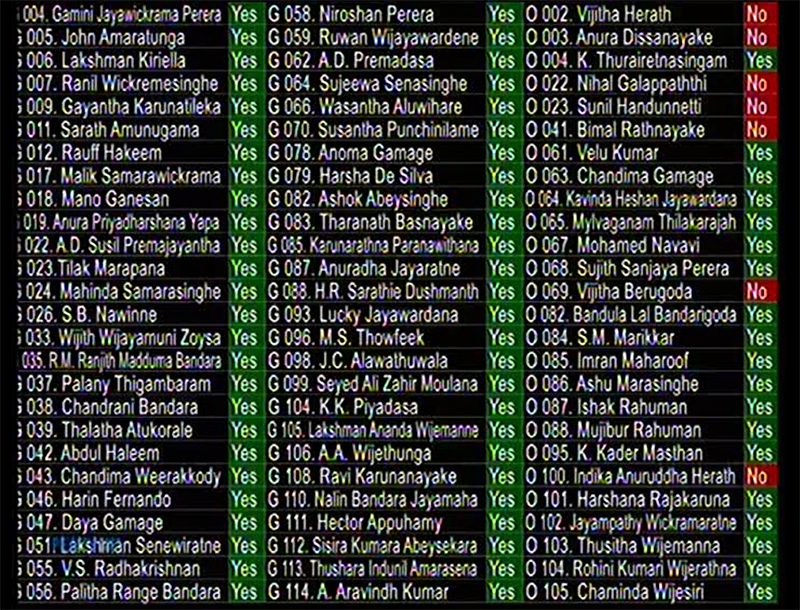 However, the SLFP candidate for Madabavita ward in Mirigama Pradeshiya Sabha is carrying out activities which violate the above circular points out Network for Election Monitoring of Intellectual for Human Rights (NEM-IHR) organization and they have already complained the incident to the Deputy Commission or elections in Gampaha District. NEM–IHR complains that the relevant candidate is carrying out an election propaganda activity using state officials of the health sector and a government hospital. 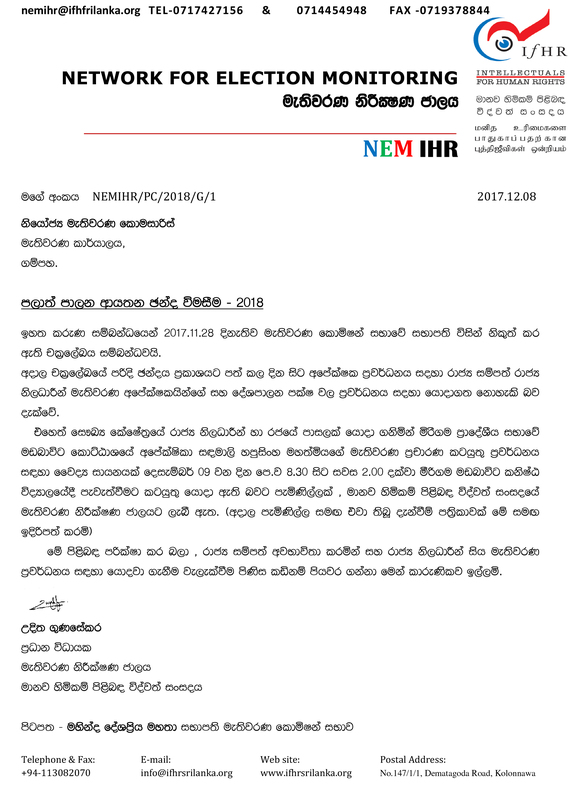 We reproduce here the announcement issued by NEM-IHR with the signature of the Chief Executive of NEM-IHR Uditha Gunasekera. With the harvest gathered during the last ‘Maha’ and ‘Yala’ seasons the country has enough rice until next April and importing coconut is illegal and the government should take the responsibility of this act says the National Organizer of all Ceylon Farmers’ Federation Namal Karunaratna. Speaking further at a press conference held at Dambulla yesterday (8th) Mr. Karunaratna pointed out the mite infestation of coconut trees has brought down coconut harvest and has destroyed many plantations. He complained that the mite infection had been brought to the country from abroad. As such, importing coconut is dangerous to the coconut cultivations in the country and it is against the quarantine laws in the country. Mr. Karunarathna pointed out that a ship bringing coconuts to Sri Lanka during the previous regime was not accepted and the whole consignment of coconuts had to be thrown overboard. He said the present Ranil – Maithri government too brought down a ship of coconuts but turned it away when media revealed it. He said it would not be surprised if vegetables too are imported and added that grass as fodder too was imported during the previous regime. Mr. Namal Karunaratna explaining the reason for the government to import rice said there is an acute fertilizer shortage in the country. He said the 50 kg bag of fertilizer sold to the farmer has been reduced to a 40 kg bag and is sold for Rs. 2500. He said on 31st December last year the Auditor General’s Department issued a special report on rice and according to this report, there wouldn’t be a shortage of rice ion the country. Displaying the report Mr. Karunaratna said with harvests from ‘Maha’ and ‘Yala’ seasons added the country would have enough rice until April next year. Mr. Karunaratna said importing rice from a foreign country in 2014 wasted Rs. 15150 million of public funds. The General Secretary of All Ceylon Farmers’ Federation T.B. Sarath, its Vice-President and the convener of National Center for the Protection of Dairy Farmers Susantha Kumara Navarathna and the Member of the National Committee of all Ceylon Farmers’ Federation Sunil Ranaweera and several others participated.